This post should be seen as a proof of concept. I'm working on creating a more concise and easier to use package of everything covered here but I felt like getting the knowledge out sooner rather than later would be of help to people looking for a way to do this. If you are interested keep an eye on the HTTP live video stream segementer and distributor project page as well as the github git repository. After my post on using FFMpeg and an open source segmenter to create videos for the iPhone that conform to the HTTP live streaming protocol I decided to see if I could get the same segmenter to work on a live stream. As it turns out it didn't take much modification to work. If you are looking for something you can buy out of the box it appears that Akamai is doing iPhone video streaming now. 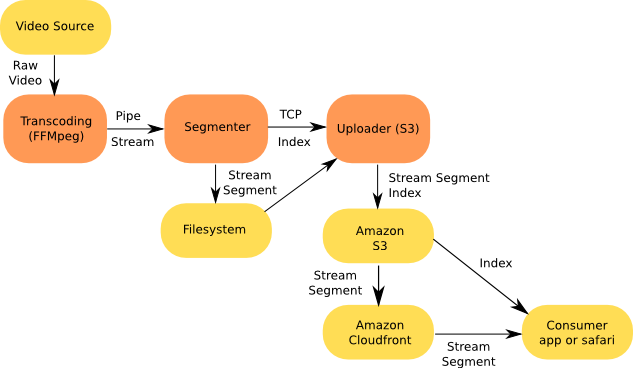 I believe that the following solution using Amazon S3 and Cloudfront is probably as good as what Akamai can offer but it may be a better choice if you don't want to have to maintain the configuration. This entry was posted in programming and tagged cloudfront, iphone, s3, video on July 5, 2009 by carson.